The weather gods have finally decided to smile on northern Europe. While the rest of the hemisphere gradually stumbles into spring, we’ve been blessed with too many magnificently warm, fine days to count. And this week seems to be their culmination: the skies are an endless expanse of sapphire, the sun is golden and intense, and everything is flowering and blossoming like mad. All I want to do is sit in the garden next to the crazy-fragrant lilac bush and bask in this crazy-unexpected heat. The only time I even think about opening my laptop is to check the weather forecast of places like Athens and Madrid (ha ha, suckers!) and delight in this rare and wonderful feeling of climatic schadenfreude. As you can imagine I haven’t felt like cooking much, lest I squander what might be the best weather of the year over a hot stove. I don’t think I’ve eaten as many salads and sandwiches in the last six months as I have in the last two weeks. But then a few days ago something arrived in the mail that threw a wrench in my routine. It was a preview copy of a cookbook so full of simple, tempting things (many of which, I was thrilled to see, don’t actually require cooking), that I was powerless to resist its gentle nudge back into the kitchen. Well, at least for a few minutes. In all honesty, I feel silly even giving this book an introduction. Can there be anyone out there who reads food blogs and doesn’t know Heidi Swanson and her exquisitely beautiful site 101 Cookbooks? I’ve been a fan—actually more like a groupie—of hers for longer than I’ve been blogging myself; hers was one of the very first blogs I stumbled upon more than six years ago and I remember feeling totally floored by the beauty and creativity being channeled into this website about food. Not only is she one of the online food community’s true pioneers, having started blogging in 2003(!! ), even more extraordinary to me is that over the years her work has lost none of its appeal—if anything, it’s gained bucketloads more. There’s a lot of reasons why Heidi’s site is fantastic: her gorgeous photography, her clean, elegant design, her gentle, approachable tone. It’s her recipes, though, that seal the deal for me. Heidi has a rare gift for putting together easy, healthy, yet utterly imaginative dishes—things that make you go, “now why did I never think of that?” I regard her as the ingredient whisperer; she knows how to make the most mundane of raw materials sparkle. And the fact that she does it all with a focus on whole, natural foods—with not a speck of meat in sight—makes it all the more remarkable. 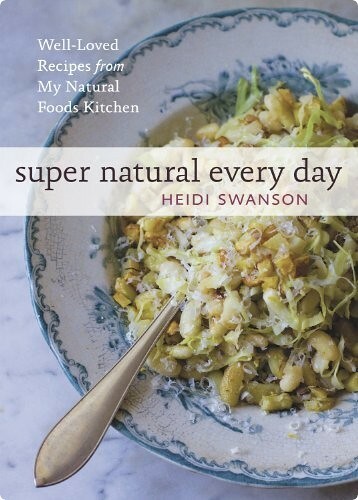 But Heidi doesn’t just write a great website, she writes great books too, full of bright, fresh, exciting vegetarian recipes and stunning photos. And the latest—Super Natural Every Day, just released by Ten Speed Press—may be her best yet. It features Heidi at her most elemental, making magic out of simple, everyday things. Take the salads, for instance; no slave to the ubiquitous leafy green, she offers up things like black bean salad with feta and roasted tomatoes, split-pea salad with cilantro-chile pesto, and wild-rice salad with goat cheese and fresh cherry vinaigrette. For breakfast she tempts us to get out of our morning ruts with prune- and brown butter-laced oatmeal, bulgur bathed in coconut milk, and mile-high spelt biscuits with the tang of greek yogurt. Her hearty, wholesome dinners include things like saffrony chickpea stew, ravioli tossed with harissa, broccoli and pumpkin seeds, and baked couscous-stuffed tomatoes. Her desserts are unfussy but compelling: sweet raspberry panzanella, buttermilk-plum cake, watermelon salad with dates and pistachios. The recipe below came out of her snacks chapter, and even before I made it I knew it was going to be a hit. That said, I was honestly unprepared for just how good this spread—a creamy drift of white beans pureed with garlic- and rosemary-infused olive oil, a splash of lemon and a handful of toasted almonds—would be. I briefly worried that just using infused oil rather than tossing in the aromatics themselves would be too subtle, but I shouldn’t have; the garlic and rosemary were definitely present but their edges had been smoothed, like they’d grown up and learned some manners. The thing that really sent it over the top, though, were the almonds; who knew that what beans were crying out for all along was a nutty, satisfying crunch? There aren’t many spreads I’d just as soon attack with a spoon as a piece of bread, but this was one. But the best part was that making it required only a few minutes away from my lilac bush, particularly since I took the (completely legitimate!) shortcut of using canned beans. That, I’m sure, will come as welcome news to all my readers in balmy northern Europe who’d rather be out frolicking in the sunshine than slaving over lunch. As for all of you stuck in colder climes, well, all I can do is offer my sympathies and remind you that your time in the sun will come soon too. Just make sure to file this recipe at the top of the stack for when it does. In a food processor, combine the beans, two-thirds of the almonds, 1/2 teaspoon salt, the lemon juice and two-thirds of the rosemary oil. Pulse a couple of times to bring the ingredients together. Add the water 1/4 cup (60ml) at a time, pulsing all the while, until the mixture is the consistency of thick frosting. You might not need all the water; it really depends on how starchy your beans are and how thick you want your spread to be. Taste the mixture and add more salt and/or lemon juice to taste. Scoop the beans into a small serving dish and make a few indentations in the top. Sprinkle with the lemon zest and the remaining almonds and drizzle with the remaining rosemary oil. Serve at room temperature with bread, crackers, crudites, etc. Note: I received this book as a complimentary review copy from Ten Speed Press. I know, isn't northern europe great right now? I actually just left Madrid and Seville – pouring rain, stormy skies, cold wind – to arrive in sunny Brussels? I've never been so weather confused! But hey, I'm going to take it for all its worth. I love Heidi's work and this was a beautiful write-up. And I think many people probably feel the same way about your website as you do hers. Oh this spread is a favourite of mine, I love the crunchiness of the almonds with the creaminess of legumes –chickpeas and beans. So good and healthy! 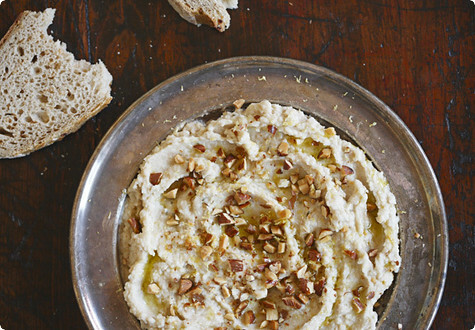 I love hummus and make it alot…So I'm going to try this recipe, it looks good! I agree with the others, that your blog is wonderful. Maybe one day you will post about your own book that has just come out. I had no idea of the sunny skies in Northern Europe. We were just in Barcelona and Madrid three weeks ago, and it was 80F. The sun seemed to follow us to The Netherlands where we saw nary a drop of rain. I received Heidi's new book as a birthday gift last week, and this bean spread is the first dish I was hoping to make. Glad to know it's as scrumptious as it looked on the page. This looks and sounds like a delicious dip. I don't digest garbanzo beans too well, so it's nice to have a delicious and digestible alternative. Thanks! I have been having a love affair with white beans for a while now, thanks for another great way to enjoy them! Can't wait to try this recipe – sounds delish! I'm following your blog for quite a while and I love your writing so much! I tried this recipe using all sorts of legumes and pulses – all spectacular, including with cooked lentils! Must be the contrast in texture over the seamless blend of flavours in the oil =) Thanks Mel! This recipe looks delicious and healthy. Thanks for sharing. Thanks for this white bean spread with rosemary and toasted almonds. It sounds like a great dish. I made this yesterday. It's all gone today! We LOVED it.